SolarWinds® Network Performance Monitor (NPM), created by network engineers for network engineers, is a complete monitoring solution that provides you with the tools you need to work smarter, improve visibility, and prevent downtime. See why SolarWinds is the worldwide leader in network monitoring. You know better than anyone that the success of your business depends on IT. You ensure success with a reliable and secure infrastructure, but monitoring and managing growing networks can become overwhelming. Enter SolarWinds Network Performance Monitor, a complete monitoring solution built FOR network engineers, BY network engineers. No matter who makes your hardware, NPM can make it easy to reduce outages and help quickly detect, diagnose, and resolve performance issues. View traffic, configuration, and performance details for on-prem, hybrid, and cloud services using critical path hop-by-hop analysis with NetPath. Monitor your entire infrastructure in a customizable console. Drill down into specific details, and view histograms and baselines for key metrics. Measure the health of the logical network, in addition to the physical network, with Cisco® ACI support. Solve your toughest infrastructure problems with the PerfStack dashboard’s cross-stack IT data correlation. Be the first to know when issues arise with intelligent alert notifications BEFORE they become critical. 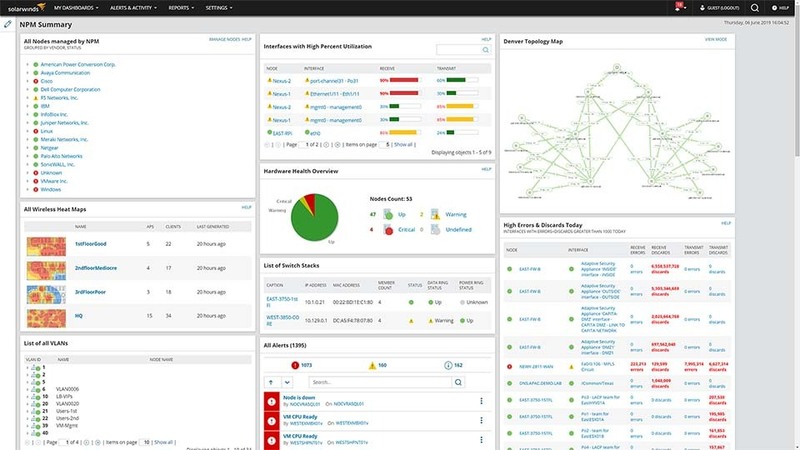 AND get deeper visibility into the health and performance of critical network hardware with Network Insights for Cisco Nexus®, Cisco ASA, and F5® BIG-IP®. Join thousands of engineers that trust SolarWinds to monitor and manage their infrastructure. Download a free trial of Network Performance Monitor today.